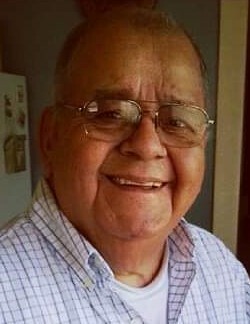 Abel T. Murillo, age 88, of Norwalk died at home peacefully on Tuesday evening, January 29, 2019 surrounded by his family. A Celebration of Life Service will begin at 2 p.m. Sunday, February 10th at O'Leary Funeral Services in Norwalk, A reception with Abel's family will immediately follow. For on-line condolences and flowers click the "send tributes/flowers" tab on this screen or call O'Leary's Flowers at (515) 981-0700. Abel Trinidad Murillo, the fifth of eight children born to Ysidro and Antonia (Alcala) Murillo on August 8, 1930 in Des Moines, Iowa. Abel grew up in Valley Junction area of West Des Moines. He attended the West Des Moines School System and graduated from Valley High School with the Class of 1949 . After school he enlisted into United States Air Force where he served honorably. Returning to Iowa after the Air Force, he went to Marquette Cement Plant where he worked as a repairman and later a bulk loader operator, loading both railroad box cars and semi tanker trucks. He retired in 1993 after working there for 44 years. In his free time Abel enjoyed woodworking. He could build anything from shelving to porch swings, wheel barrels, and toy boxes. Abel also liked to hunt pheasant, quail, and rabbit. While living in Valley Junction he was one of the Holiday Park Girls Softball Coaches for 20 years. Together Abel and Mary enjoyed sitting on the banks of a river or lake and fishing. They also enjoyed playing cards such as rummy and their poker nights at home. Abel died at home peacefully surrounded by his family, Tuesday evening, January 29, 2019. He lived 88 years, 5 months, and 21 days. He was preceded in death by his parents; his wife, Mary on March 8, 2012; and his siblings, Jess, Tito, Manuel, and Abigail Chia. He is survived by his children all living in Norwalk, David (Linda), Theresa (Tony) Ayala, Liz (Darryl) Olson, Chris (Margo), and Pat (Tracy); 14 grandchildren, Matthew, Jason, Caleb, Katie, Joe, Danny, Chandler, Erica, Brian, Alex, Nicholas, Samantha, Jacob, and Maddie; several great-grandchildren, three siblings, Jane Bejarno, Mike Murillo, and Mary Negrete; and a host of nieces, nephews, and good friends.